This interview was done with Jack Ladoga, lead singer of T.S.O.L., by Russ Taylor and myself [Dave Champion] on the way to Carleton University. T.S.O.L. consists of Jack - lead singer, Todd Scrivener - drums, Mike Roche - bass, and Ron Emory - guitars. NCFC: How long have you guys been together? Jack: We picked up instruments about two years ago and have been together since. NCFC: On your last tour you had Frank Agnew (ex-Adolescents) playing guitar along with Ron. What happened to him? JACK: After the last tour we parted company, musical differences, I guess. NCFC: How did you come up with your name? JACK: We stole it from this church called "True Sounds of Liberty". NCFC: The "Abolish Government" ep was very political and the "Dance With Me" lp was more or less what people call "horror rock". Why the change? JACK: It wasn't really horror rock. That term is for bands like 45 Grave and Christian Death. We just keep trying to sound different so people don't lose interest in us. As for the political stuff you'll find our new ep (Weathered Statues) has a couple of songs that deal with politics. Our new album that we're working on now will be mainly political. So we're always changing our sound. NCFC: Do you feel there is a noticeable difference in the scene in the different cities you've visited or are they all headed in one direction? JACK: No, a lot of them are different. Like in L.A. the scene has so many kids and like some of these kids are like 10 years old and they love T.S.O.L. 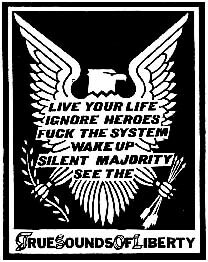 and Black Flag and the Circle Jerks and then we go to Salt Lake City and we play for 40 people in someone's basement. But we think every small scene eventually becomes big. Ottawa will get big real soon, I think. NCFC: What are your musical influences? JACK: T.S.O.L. but I always tell Ron his guitar sounds like Pink Floyd. NCFC: Right now who are your favorite bands? JACK: I don't own any records or any tapes so the only band I like now is us. NCFC: What's your favorite horror movie? JACK: I don't watch horror movies. My favorite movie is "Clockwork Orange". NCFC: This question is on a lighter side. The lyrics to "Code Blue" are about necrophilia. Why did you write them? JACK [laughs]: I used to work in a graveyard digging graves and I always thought these bodies would come back to life and sneak up behind me. So I wrote a song about it. NCFC: Thanks a lot, Jack. JACK: Hope you guys enjoy the show tonight.